myExperiment is a collaborative environment where scientists can safely publish their workflows and in silico experiments, share them with groups and find those of others. Workflows, other digital objects and bundles (called Packs) can now be swapped, sorted and searched like photos and videos on the Web. Unlike Facebook or MySpace, myExperiment fully understands the needs of the researcher and makes it really easy for the next generation of scientists to contribute to a pool of scientific methods, build communities and form relationships - reducing time-to-experiment, sharing expertise and avoiding reinvention. 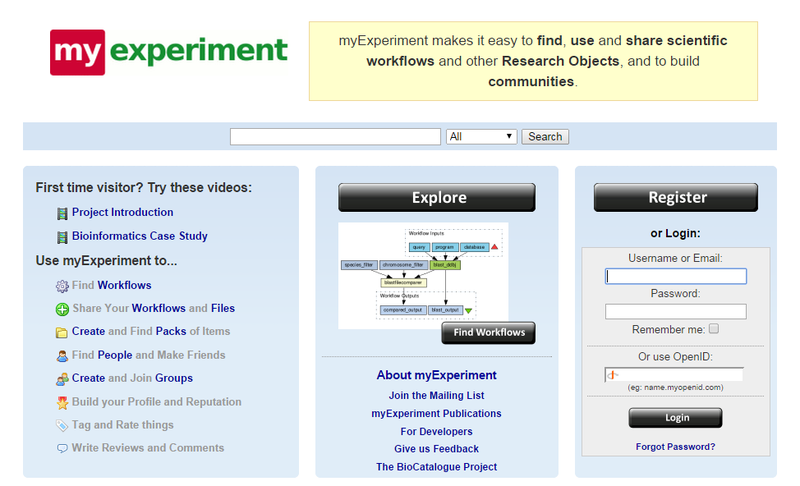 myExperiment is now the largest public repository of scientific workflows. It supports Linked Data, and new features for workflow preservation are under development in the Wf4Ever project, one of several Partner Projects. myExperiment is brought to you by a joint team from the universities of Southampton, Manchester and Oxford in the UK. myExperiment is currently supported by three European Commission 7th Framework Programme (FP7) projects: BioVeL, SCAPE, and the Wf4Ever Project as well as the e-Research South and myGrid EPSRC Platform grants.